Winter solstice (shortest day and longest night) 22nd December. Nobody actually knows the day or the month when Jesus Christ was born. However, the Feast of the Annunciation falls on the 25th March which is when Christians celebrate the day Gabriel called on Mary to tell her she was to be the son of God. 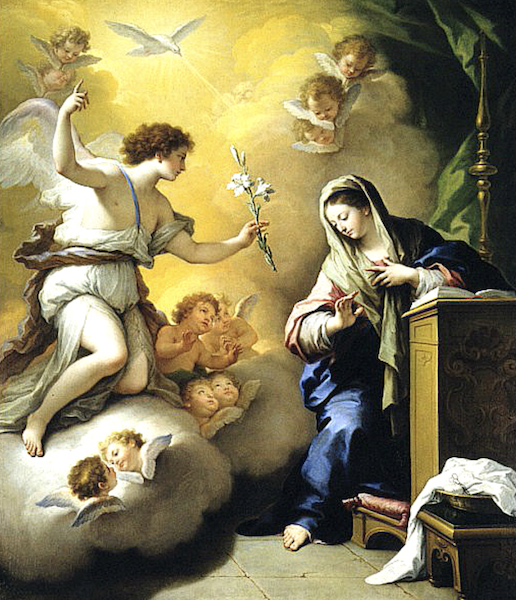 This painting illustrating the Annunciation is by Italian artist Paulo De Matteis (1662 -1728). Christmas is exactly 9 months after the Feast of the Annunciation. That’s biology for you. 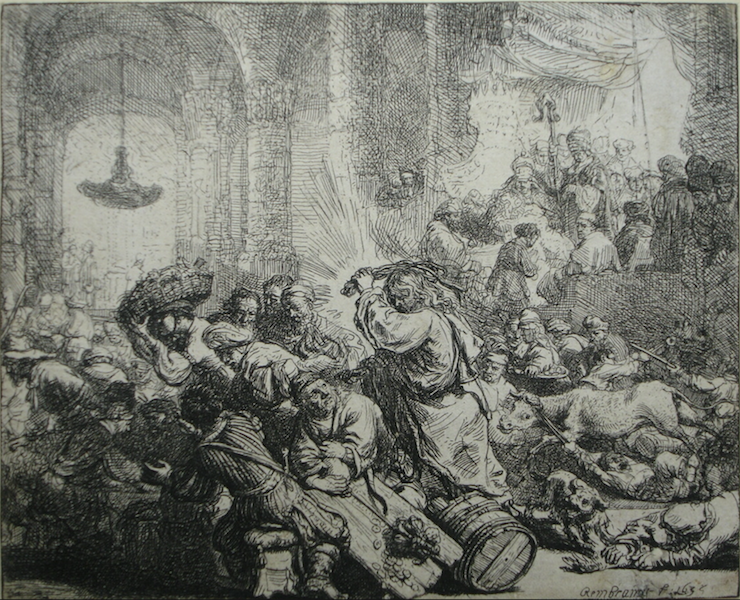 Christmas also coincides approximately with the Winter Solstice on 22nd December. Also known as The Shortest Day. Now there’s cause to celebrate. You don’t need me to tell you the ‘traditions’ of Christmas. Suffice to say, it is cruel that we have to go bear it in the middle of the darkest, wettest and most depressing time of the year. It’s enough to push you over the edge! Us beekeepers are fortunate because there is a lot of stuff out there to be getting on with at christmas. The bees should have been fed and treated for Varroa after the honey was extracted at the end of summer. However, midwinter is the time when the queen bees should be off lay and there should be a short broodless period which is ideal for a backup treatment with Oxalic acid. I say should be because it is not always the case especially in a mild year or where they ivy bloomed late. So long as there has been a bit of cold weather – below 15 degrees – and a decent interval since you last saw yellow ivy pollen going in to the hives – Christmas should be perfect. Click here for more about Oxalic acid for Beekeepers. I should add that midwinter treatment may not be necessary if you are confident that the conditions in autumn were good enough to allow your thymol/MAQS to work properly. While you are out there – check the feed status of your bees. Heft the hives to assess the weight and if they seem light put some fondant on. It won’t do any harm and if they need it later – it’s there. If the bees seem weak and are clustering close to the top of the frames you could choose to remove the crownboard and place the fondant directly onto the bees where they will find it easily. If you do this – add an eke and pack the space around the fondant with old jumpers, sacking or some other cosy stuff. Don’t put pollen substitute on yet – too early – wait for February. Make sure the hive roofs are weighted down with stones or tied with ropes – winter has hardly started and there could be gales. And there could be animals. Mend broken equipment. Treat spare boxes if they need it. Make up new stuff but don’t put wax into new frames till spring or it will just lose its fragrance and go all crispy then the bees won’t work it properly – they’ll draw all that abstract stuff with holes and buttresses. All your equipment, supers, spare brood boxes etc could all do with a good scrape down – propolis flakes off well in the cold weather. Save all the little bits of beeswax you will be amazed how it mounts up. Click here for how to tackle your beeswax mountain. Strip down old frames with black, knackered or holy wax – that’s wax with holes in it. Burn the really black horrible wax – use if for lighting fires that’s the only thing it’s good for. Click here for how to render beeswax. If you are storing used brood frames and you know you have a wax moth problem you might like to take this opportunity to treat them with acetic acid. There is also a biological control agent from Vita which uses a micro-organism to attack wax moth. The product is called Certan and the micro-organism is called Bacillus thuringiensis. 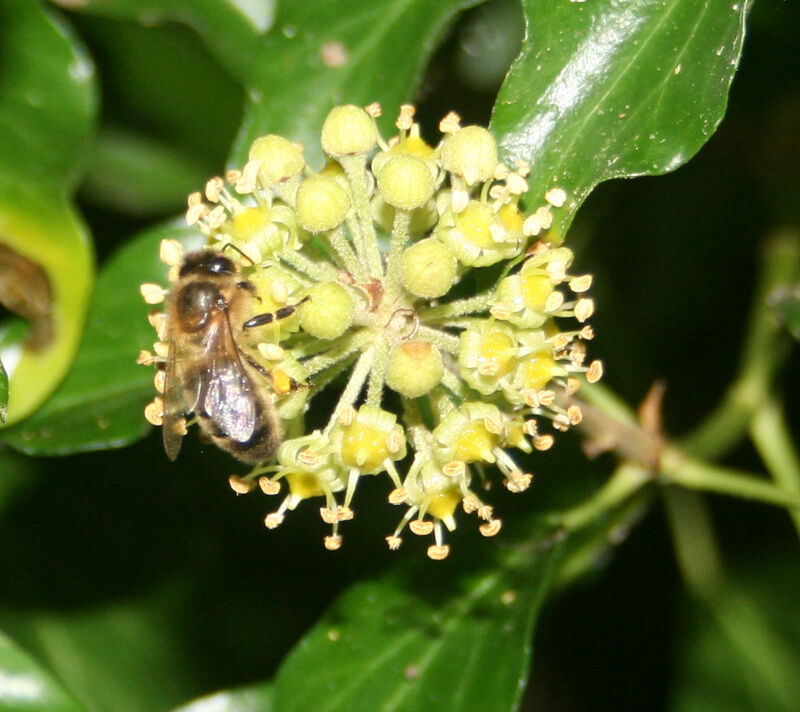 There is very little floral forage out there for the bees at Christmas. 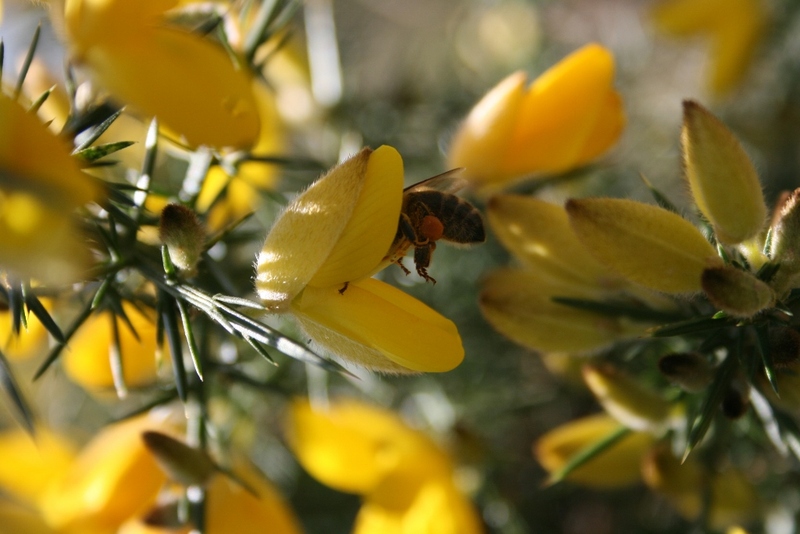 This year there is quite a lot of gorse in bloom. In some years there may be the dregs of the ivy. Also some winter garden plants such as Mahonia or even snowdrops.